The Florida Department of Corrections is divided into three jurisdictions in order to best serve the needs of inmates, employees, and communities throughout the state. Like most other states, Florida operates most of its own facilities like the Baker Correctional Institution, the Glades Correctional Institution, and the Dade Correctional Institution. The state does have a number of privately run facilities as well - commonly called "Correctional Facilities", these include the Gadsden Correctional Facility, the Lake City Correctional Facility, and the Moore Haven Correctional Facility. Currently, there are approximately 103,028 incarcerated inmates contained in over 60 state prisons and less than 10 federal prisons throughout the state. As of the last data year, 23,835 corrections officers work in front line support with inmates and national statistics forecast that by 2022, that number will grow by almost 1,200 new recruits, not including additional open positions to meet retirement, advancement, and attrition demands. There's lots to learn about becoming a correctional officer in Florida - read on for more information. Remington College-Heathrow Campus ranks first in our latest rankings with twenty-three students completing programs in law enforcement administration out of a total 124 graduates in the 2012-2013 school year. Located in Pensacola, Florida, George Stone Technical Center offers certificate and associate's degree programs for corrections officers. With a commitment to excellence GSTC has developed a comprehensive program to make sure that graduates have the skills they need to enter the corrections workforce. Included in the course of study are communications, working with special persons, and supervision aspects of the role. Fort Myers Institute of Technology is located in the heart of Fort Myers, Florida and is a public, two-year college that provides certifications and associates degrees to students. The Institute is certified to train recruits to become Florida State Certified Correctional Officers. Additionally, the facility provides specialized training in order to meet the professional development needs of officers in the field. The FMIT staff work hard to imbue students with the tools to ensure a safe, secure, and humane corrections environment. Florida Memorial University ranks 4th in our rankings with 58 students graduating from programs in law enforcement administration out of a total 458 graduates. The Florida Panhandle Technical College is located in Chipley, Florida, and is a public, 2-year college offering certifications and associate's degrees to students. Washington-Homes is committed to providing exactly the amount of training that student need in order to start their career. With coursework focused on the fundamentals of correction, including Criminal Justice, Ethics, Defensive Tactics and Physical Fitness, successful graduates are ready to pursue recruitment as a corrections officer. Edward Waters College ranks sixth in our latest rankings with 19 students completing programs in criminal justice out of a total 184 students from the 2012-2013 school year. Located in Inverness, Florida, Withlacoochee Technical Institute is a public, 2-year college serving hundreds of area and online students. Fully accredited, WTC offers certificate, associate's degree and bachelor's degree programs, as well as a wide variety of industry certifications. WTC offers Law Enforcement and Corrections programs as well as advanced training and professional development to veterans in the criminal justice field at the Citrus County Public Safety Training Center. WTC core courses train criminal justice students to exemplary levels of academic and practical preparedness for future graduates to the field. Established in 1965, South Florida State College is located in Avon Park, Florida. With four campuses to serve its student body, SFSC is a public, 4-year college with certificate, bachelor's and associate's degree options. Students interested in pursuing and education in corrections are encouraged to apply to the college's Correctional Officer certification program. The program meets all state requirements for potential recruits and focuses on a combination of academic and practical knowledge to give future corrections officers the skills for success in their career. Florida Keys Community College is located in the heart of Key West, Florida. Founded in 1965 and with a student body of just over 1,200, FKCC offers degrees at the certificate, associate's degree, and bachelor's degree levels. Many students enrol in FKCC's criminal justice studies programs and upon graduation may enter corrections directly, or through other similar career paths like security, crime analyst, and emergency communications specialist. FKCC's rigorous core courses and flexibility in accepting transfer credits, make the program a viable option for students looking to transition to a new career. 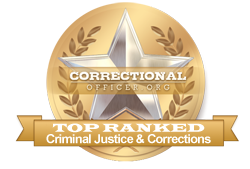 Bethune-Cookman University ranks 10th in our rankings with sixty-six students graduating from programs in corrections out of a total 950 graduates. Saint Leo University ranks 11th in our rankings with 678 students graduating from programs in corrections administration and criminalistics and criminal science out of a total 10,186 graduates from the 2012-2013 school year. Founded in 1967, Suncoast Technical College is a fixure in the Sarasota area. The college's mandate is to excel in offering technical education to area students that meets the community and state need for an exemplary workforce. Students interested in pursuing a career in corrections are advised to consult Suncoast's Criminal Justice Academy to peruse requisites, and other important data. The Academy offers training for both law enforcement and corrections. Saint Johns River State College, founded in 1958, is an acclaimed institution in the city of Palatka, Florida. As a public 4-year college, SJR State offers a wide variety of certificate programs, as well as associate's and bachelor's degrees. Students enrolled under the Criminal Justice Department can expect state-of-the-art equipment and seasoned instructors that help prepare them for their chosen career. Technical Education Center-Osceola ranks 14th in our rankings with 50 students completing programs in criminal justice out of a total 898 students in the 2012-2013 school year. Keiser University-Ft Lauderdale ranks 15th in our rankings with 456 students graduating from programs in law enforcement administration, criminalistics and criminal science, and criminal justice out of a total 9,366 graduates. Founded in 1947, Chipola College is a public, 4-year college located in Marianna, Florida. Chipola College offers a wide range of certificate, associate's and bachelor degrees. Students who are interested in pursuing a career in corrections are encouraged to apply to the college's law enforcement or corrections programs. With unwavering emphasis on academic and practical skill acquisition as well as physical fitness, graduates from the program may apply directly to a corrections recruitment agency. Hodges University ranks 17th in our latest rankings with 57 students graduating from programs in law enforcement administration and criminal justice out of a total a thousand graduates. North Florida Community College ranks 18th in our latest rankings with thirty students graduating from programs in law enforcement administration and criminal justice out of a total 708 graduates. City College-Altamonte Springs ranks nineteenth in our rankings with 5 students completing programs in securities services administration and management out of a total 118 students. With just under 20,000 undergraduate students, Tallahassee Community College is a well-respected institution in the city of Tallahassee, Florida. A public 2-year college, TCC offers a range of certification and associate's degrees in order to prepare students for further study, direct entry to the workforce, or advanced professional development. Students interested in the field of corrections should note that TCC's Corrections program is certified by the Florida Public Safety Institute in keeping with state standards. Students will benefit from a mix of practical and academic programming to prepare them for their future career. Candidates who pass the assessment portion of the hiring process contacted by Florida's Department of Corrections as postings become available, however final hiring decisions are made after candidates complete a practical training component at a state facility. The state of Florida is committed to serve and support correctional facilities in the state by encouraging personnel in the field. At this time, the median income for front-line correctional officers throughout the state is slightly lower than the national median at $36,600 than the median national income of $39,800, however individuals committed to professional development will have salary increases to mitigate this salary. CareerInfoNet.org has published state and national trends at http://www.careerinfonet.org/occ_rep.asp?next=occ_rep&Level=&optstatus=011000000&jobfam=33&id=1&nodeid=2&soccode=333012&menuMode=&stfips=12&x=67&y=17 which predict that growth in Florida is in decline until 2022, while national figures represent a 5% growth. The predicted curve translates into approximately 560 vacancies per year over the next decade. The table below lists career information collected by the Bureau of Labor Statistics for correctional officers in Florida. The table is sorted by total employment, with the largest metropolitan areas listed first.